I'm convinced that the creator of the Looney Tunes characters was a speech-language pathologist (SLP) in a past life. 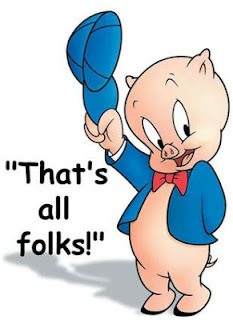 This week I’m are going to talk about sweet lovable Porky Pig. Yes, you don't have to be an SLP to figure out that Porky has a stuttering problem. Now, we don't know the exact age of Porky so it is hard for me to say if it is just a normal dysfluent phase in his/her development or if in fact it is a true stuttering disorder. If Porky is between the ages of 3-5, or thereabouts, I am going to say it is most likely a developmental phase and he should snap out of it. So parents of young children don't stress out about this. The saying "never let them see you sweat" is good advice if you have a child who is "stuttering" and are younger than 6. 1. Don't draw attention to the dysfluncies. 2. Allow your child as much time as he/she needs to express themselves. 3. Don't interrupt them and "help" them get their words out. 4. Be a good speaking role model. Speak slowly, don't interrupt others or allow others to interrupt you. 5. Remain calm and do not let on that you are concerned over the dysfluncies, this will make your child anxious and could increase the dysfluncies. 6. Make sure all caregivers are on the same page and understand how to react, or I guess I should really say, NOT react. Tune in next week when we will talk about another Looney Tunes character, maybe Tweety, or Sylvester, or Donald Duck.....so many characters, so many speech problems.....aaahhhhhh. What are your specific questions about stuttering and if you are dealing with a true stuttering disorder? Let me know. Thanks for this, Jennifer! My son who is now in first grade has had trouble with reading and writing because he has had some speech delays. He doesn't stutter, but it is tough to watch him struggle with reading. So, true, Jennifer! My littlest went through this last year (she was just turning 4). It was quite pronounced just before and during the summer, but by the time she went back to school last September, it was pretty much gone. Her preschool teacher had me worried and suggested we call an SLP. I did some research first and found some of the same info you shared. We waited it out, were very patient, and it went away. I wish I had had the benefit of your wisdom this time last year! Thanks for sharing. thing, thanks for being so patient and calm as your child worked through that!